Last week saw Sensei hit 2 Guns hit his prediction dead on ($27 million OW). There’s plenty of new releases to debate this week. 1. “Elysium” ($32 million) – Film dodged a bullet with Planes not pulling in positive reviews from critics and audiences. Still, it will be a short celebration as a John Carter-like opening seems set. Again, like the box office flop Carter, film is enormously expensive ($100 million) and even last Spring’s Oblivion couldn’t earn that amount in sci-fi off a much higher opening ($37 million opening, finished at $89 million domestic). This Summer’s Pacific Rim also didn’t break the $100 million mark off much higher anticipation. Bad buzz is already turning on Elysium, so a giant drop in its second weekend is already baked in. 2. “Planes” ($24 million) – The weekend is just there for the taking, but buzz is low. This spin-off inspired by Pixar’s Cars is instead is looking at a Gnomeo and Juliet-like opening ($25 million). This one looks to be a missed opportunity. 3. “We’re The Millers” ($20 million)– Film will steal away much of the 18-25 demographic. That prevents Elysium from breaking out, and will give this one a healthy start. 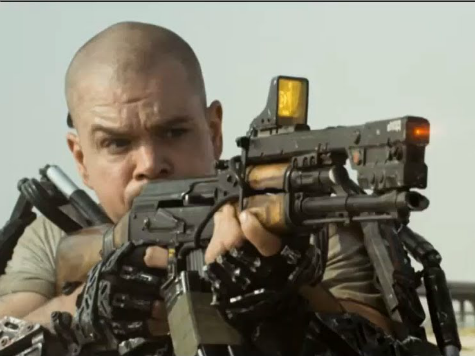 Depending of how the bad buzz develops for Elysium, this comedy could easily go higher. 4. “Percy Jackson: The Sea Of Monsters” ($18 million) – In such a crowded field, there’s always one that gets left out. That looks to be this sequel to the modest hit Percy Jackson: The Lightning Thief. Lack of star power also hurts this franchise installment. Look for modest results. 5. “2 Guns” ($13.4 million) – A decent second weekend, film should break the $50 million domestic mark. Film hopes to stay on the same course as Denzel Washington’s previous hit Inside Man, which opened similarly (around $28 million). Could be a tough road though, considering that film was a heist thriller and 2 Guns is an action comedy. That’s Sensei’s calls. Enjoy the weekend.